Images of the female form began appearing on coinage millennia ago and this tradition continues to be exceedingly important in Numismatics today. Ancient Greek coins featured the image of the Goddess of Wisdom, Athena, as well as other hisotrical women and Goddesses. Roman coins also featured female deities like Libertas, the Goddess of Freedom, and the profiles of powerful women, such as the mothers of Caesars and behind the scenes power brokers. Fast forward a few thousand years and today, the female form continues to be a driving force in Numismatics, often symbolizing the very ideals and spirits of issuing Nations. While the allegorical character of “Lady Liberty” is a prevalent emblem of the founding ideals of the United States, many countries also prominently feature metaphorical female figures on their currency. Where did this Tradition Begin? This concept of Liberty has roots in the ancient Greek and Roman tradition where a multitude of gods and goddess where worshipped as they were considered the sovereigns of certain values and aspects of life. 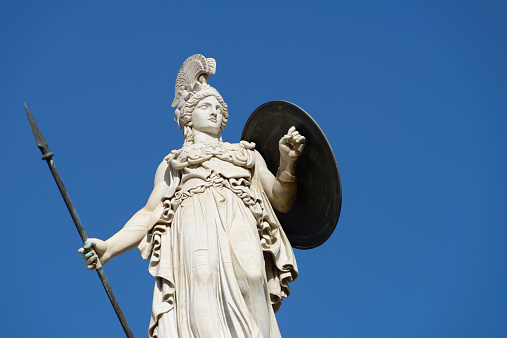 Eleutheria, was both the Greek word for, and the female deity who, represented Liberty or Freedom. This concept is also closely associated with the Goddess Artemis, whose image was used on ancient Greek coinage. Eventually, the Romans updated and renamed the Goddess, “Libertas.” In their society, she represented the republican ideal of personal liberty and freedom, which have always been represented by a female image in the classical tradition. It is no surprise that that these early societies who established the first democracy and one of the most prominent republics in history respectively, would so idolize the concepts of Liberty and Freedom. These idealized values and their common feminine representations, were adopted by the Romantic and Naturalism movements, and are thus represented in 19th Century depictions of these allegorical ideals. In monarchy’s of old, currency often carried the image of a governing individual, which reinforced their power over the people they oversaw--after all, one is likely going to give credit to the king or personage on the coin when one buys his meal. It was because of this close association with monarchy that the Founding Fathers of the U.S. decided to break with this monetary tradition. When the need for a uniquely American currency was intriduced to Congress, President George Washington was first proposed to appear on the coinage. It was eventually decided and declared in the Mint Authorization Act of 1792, that instead of iconizing a single ruler, that “upon each side of said coins there shall be an impression emblematic of liberty, with an inscription of the world Liberty…” This move further removed the new nation from the concepts of monarchy and the singular rule of one man. It also helped establish the American Ideals of freedom and representation for all, as the guiding principles for the new nation. Lady Liberty represents the concepts of individuality, beauty and self-reliance. This ideal is in the grasp of the common person, rather than being “to the manor born.” Both the American and French Revolutions were reactions to a political climate designed to empower the elite. These dynamic uprisings would ultimately champion individual representation to empower the majority of people, rather than a ruling class or a specific monarch. 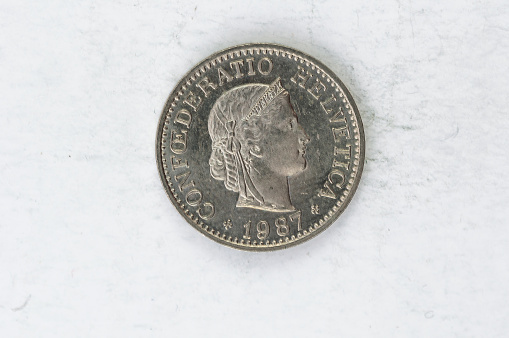 This distancing from a specific historic person or class, was supported by the use of representations of an allegorical ideal like Lady Liberty, the closely associated goddess Columbia and the French Marianne, on coinage. However, some ruling figures still appear on coins today, and they are not limited to Kings and Emperors. Like countless male figureheads before and after, Catherine the Great appears on Russian coinage as a way to solidify her power and image. More recently Queen Victoria and her great-great grand daughter Elizabeth II on British coinage serve the same purpose: to celebrate and embody power and confer that power on the pictured person; a different approach to representational currency for sure. Although Congress used imprecise language in calling for an “impression emblematic of Liberty” on the obverse of all new federal coinage produced under the Mint Authorization Act of 1792, represent Liberty they did. The United States struck its first coinage featuring Liberty as wearing or almost wearing-- her Roman “Freedom” or Phrygian Cap. The Phrygian cap was a symbol from antiquity that a person was not a slave. Variations on this image were struck well into the 20th Century for U.S. circulating coinage, although this ended with the 1947 Walking Liberty Half. It was from this iconic reverse design that one of the United States Mint’s most popular modern issues, the American Eagle Series originates from. This famous Adolph Weinman portrayal shows Liberty confidently moving towards the future, holding an oak branch along with a laurel, both military and civil symbols respectively. The depiction of Liberty has changed a great deal over the years, some mere aesthetic changes, some symbolic. Certain designs featured Liberty in a seated position, others standing. She is more often than not, pictured wearing a Freedom Cap or a coronet, that is engraved with the name Liberty. 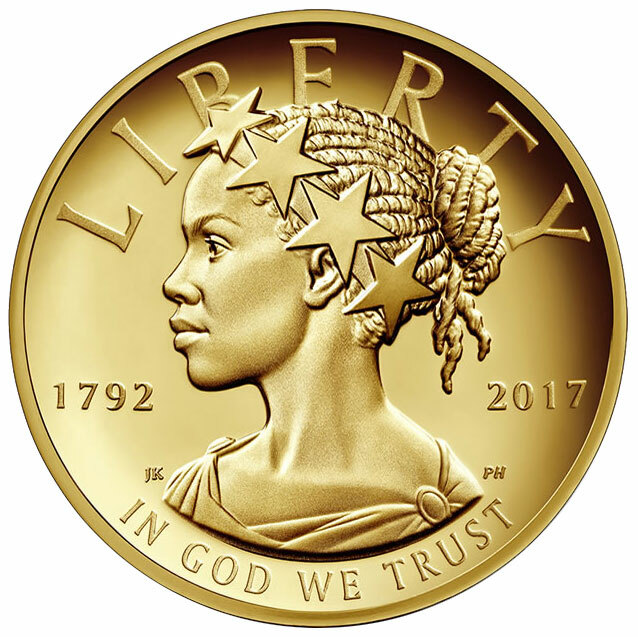 Sometimes her full portrait is depicted, as in the Standing Liberty Quarter, where she holds an olive branch as well as a shield, representing both peace and a readiness to defend herself. In others, only her head is depicted, as is the case of the Peace Dollar. On the beloved Morgan Silver Dollar, she wears both the Phrygian Cap and an inscribed crown. 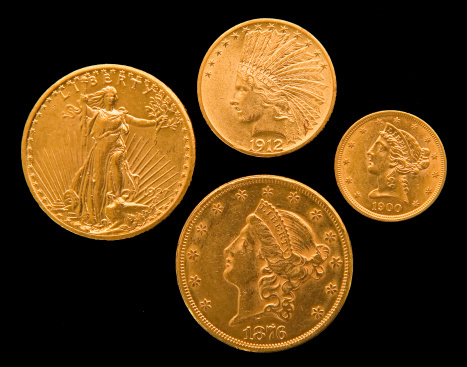 Portrayals of Liberty continued on non-circulating coinage and still persist today. Some of the more notable modern varietions of Liberty are in the high relief American Liberty series which depicts “the different faces of Liberty,” to more accurately reflect a culturally and ethnically diverse 21st Century America. Liberty is not only an American concept. In fact, the young country adopted such ideals from Ancient and contemporary European nations as was detailed above. 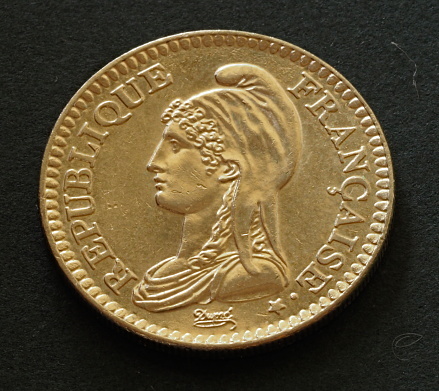 This allegorical representation appears on French coinage in the form of Marianne, an often bare-breasted woman wearing a Phrygian Cap. What Lady Liberty is to the U.S, Marianne is to France. She is the representation of France as a nation and the ideals it promotes such as liberty and reason. She became a popular representation especially during the French Revolution, which so influenced the establishment of the United States. Helvetia, known as the “goddess-protector,” frequently appears on Swiss coinage as she represents the country and its ideals, namely unity. She is often portrayed with braided hair topped with a wreath, which symbolizes the unification of the various cantons of Switzerland, which occured in 1848. She is sometimes grasping a spear, and always carrying a shield that bears the Swiss Arms. Her depiction, and thus that of Switzerland, shows both her defensiveness and her ability to protect herself, as well as the importance of unity in the country's history. In 2015, the U.S. Treasury Department announced plans to include portraits of notable women on circulating paper currency beginning in 2020. The last time a woman was featured on U.S. circulating paper currency was in 1886 when the portrait of Martha Washington, the first First Lady of the United States was used on a $1 Silver Certificate. Both hisotrical and modern women, have made great contributions to the field of Numismatics over the years. For instance, Laura Gardin Fraser, co-designer of the 1926 Oregon Trail Half Dollar and the 1999 George Washington $5 gold coin, is the only designer to contribute to both the Modern Commemorative series and the Classic Commemorative series. Elizabeth Jones, the 11th Chief Engraver of the U.S. Mint was the first, and to this day, the only, woman to occupy that storied post. Contemporary designers and sculptors Phebe Hemphill, Donna Weaver, Renata Gordon, Barbara Fox, Emily Damstra, and Patricia Lucas-Morris have contributed some of the most meaningful and attractive designs in the U.S. Mint’s Modern Commemorative program in recent years. Not only is our conception of Liberty evolving as our society and culture evolve, Numismatics is changing too. Now we have women creating new and exciting designs and visions of Liberty and coinage in general, in a field that has historically been dominated by men. We have women becoming involved as collectors,dealers, and numismatic writers at an unprecedented level. These are exciting developments for the field and suggests new, diverse and interesting points of view, and thus ways of collecting to come in the future.